Samsung Galaxy S4 is no doubt one of the most popular and the best Android smartphone right now. But there are lots of people giving negative reviews about its build quality, specially the fragile screen which is claimed to have the latest Gorilla glass. Due to this, Samsung is out with a brand new video showing the durability of the Samsung Galaxy S4 in various kind of situations. 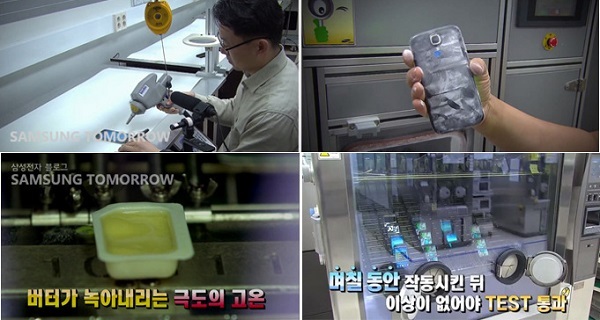 This durability test of Samsung Galaxy S4 includes the Drop test, Humidity test, Heat test, Tumble test and Impact test. There is also a Sink test performed in which the Galaxy S4 is submerged in the water for awhile. There are also few tests like Dust test etc are conducted which are not shown in this video prepared by Samsung.If you are planning to buy a Samsung Galaxy S4 then, this video can really help you in making your mind about it. Have a look on the Samsung Galaxy S4 durability test video below and never ever try to perform any of them with your own device. How to samsung galaxy s4 flash file download Thanks.